Ulaanbaatar, Mongolia. Rev. Masamichi Kamiya, Religions for Peace Asia senior advisor, called on common efforts to advocate nuclear disarmament at the 2nd Ulaanbaatar Process meeting on the 14th to 16th of November. The meeting was co-hosted by the Global Partnership for the Prevention of Armed Conflict (GPPAC), Peace Boat, a Japanese civil society organization, the Mongolian Ministry of Foreign Affairs and Blue Banner, a Mongolian civil society organization. 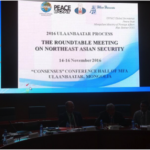 The Ulaanbaatar Process is a platform of a civil society dialogue for peace and stability in Northeast Asia. This Process was initiated by the GPPAC, a world-wide alliance of civil society organizations structured with 15 regional networks, based on a network approach of information exchange and sharing of experiences. Central to the Ulaanbaatar Process, furthermore, is the emerging strategic role of Mongolia within the Northeast Asian context. Mongolia is a state with internationally recognized nuclear-weapon-free status that benefits from political security assurances of the five nuclear weapons states. As part of its mission to work towards a global shift from reaction to prevention of violent conflict, GPPAC strives towards multi-actor collaboration and local ownership. Together with faith-based organizations, GPPAC members aim to achieve greater synergy in the field of conflict prevention and peace building by connecting different levels (from national to regional and global), and to strengthen the role of local civil society groups in conflict regions. GPPAC supports the capacity of the regional networks to interact and act together, and facilitates regional and global exchanges, where members from different parts of the world come together and learn from one another’s experiences and develop joint strategies.